I am blessed and honored to continue to cook up liturgical elements for worship at the United Christian Church in Austin. Admittedly, it feels like I haven’t been in the kitchen in a very long time. I’m editing more. I’m pulling more books off the shelf. I don’t have the familiar recipe of these liturgical words memorized anymore. It’s not a part of my breathing as it once was when I led worship every Sunday. I am shocked that Epiphany has been so short in years past and I don’t have anything in my folders from past worship services, but it’s forcing me to be creative. Our church is in the midst of transition. The Senior Pastor left for another call just before Advent and so the first set of prayers reveals a bit of that angst and struggle. (Honestly, I don’t think that this church is struggling at all.) Having done work with churches in transition most recently, it felt right with the Gospel. The second set of prayers for the Sixth Sunday of Epiphany pick up with the Beatitudes. As we are a congregation in transition, I pushed myself to write something that wasn’t a unison prayer following the Call to Worship. And so, the second ingredient for that Sunday is something to spice up our prayer time. This will be shared after the congregation shares their spoken prayers and just before the Prayer of our Savior. One: Come, come, whoever you are. One: Ours is not a caravan of despair. One: Come, come again, come. We come tired, weary and worn. We have already done so much work, so much heavy lifting. but instead we are invited again to roll up our sleeves. We must haul out the boats and put in another hour, maybe two. There is more to be done. There is always more to be done. wondering what could change. What will one more hour do? We let down our nets, just as we are told. We wait for what will catch us. O Holy One, catch our tired bodies today. One: We have come to this level place. Many: We have come to look each other in the eye. and call each other blessed. but we have come to rejoice. Many: And so, we will leap into blessing. Holy One, be with us in this praise. Many: Remove from us the lust for power. Let greed not enter our hearts, O Christ. One: Woe to you who are full now. Many: Remind us that our full pantries offer no guarantees. Make us aware of how very vulnerable we are, O Christ. One: Woe to you who are laughing now. Many: Forgive us for every sarcastic comment. Empty us of snark, O Christ. Many: O Christ, heal us of our arrogance. Call to us with your words of blessing. Blessed are you who are hungry now. for we will be filled. Many: Blessed are we when life just feels much too hard, for we will laugh. revile you, and defame you. been called, for in this level place there is healing. In just four days, it’ll be thirty-two years since she died. It will be thirty-two years since my mother died. I have to pull out a calculator every year to subtract from the current year. Surely, it hasn’t been that long. It hasn’t been this many years without her. It seems impossible to believe amid so much joy. My sassy little girl started walking this weekend. She’d taken a few hesitant steps about a week ago but we went to a birthday party on Saturday full of four year olds and she wasn’t going to be left in the dust. She toddled across the room. She sat at the big kid’s table. She had chicken nuggets for the very first time and her smile was just so big. Though she has no interest in my growing belly, I’ve started talking to her about her baby sister. She won’t be the baby anymore. She’ll have a baby sister. Of course, this doesn’t register at all but she will retrieve her baby doll from across the room and shove a bottle in its mouth with great force. Every time, she looks up with this great big smile. I don’t remember how it was last year. I don’t remember if grief consumed my entire January in a blizzard of tears, as it once did. I don’t remember if the change in climate made the days before Groundhog Day feel less heavy. Or if I was too tired from a newborn baby waking up to the world in new ways to notice that it was even that time of year again. There has only been one Groundhog Day since I became a mother. Only that one, and I don’t remember how it was. I only remember how my husband and I ordered Chinese for dinner because, as a New Yorker, this is my preferred comfort food. I remember the excitement of finding any restaurant that would deliver to our rural address only to be horrified by what was in that delivery bag. Jalapenos should not ever be in Chinese food. It was only this unsettled feeling that this is not how this day should be that remains. There is that sense about this day for me. Somehow, the day my mother died should be set apart. It should be different. I want it to be different so that heaven might mingle with my ordinary world. It’s something I’ve felt in the days before. As the new year dawns, a sadness emerges. A sense of loss comes close. I’m more aware of what is missing than what might be just beginning and so I’ve allowed myself this one day to feel all of that grief but that’s harder to do with a giggling ball of energy always at my side. She’s not old enough yet to understand what happened thirty-two years ago. It’ll be a few years yet before she has any real understanding of death, but she’s started to look more like me. When she smiles now, it’s my grin. She tilts her head like I do. She makes the same silly faces that my mom probably made with me. I don’t know how I’ll ever tell her that she looks like her grandmother. I guess that’ll be how grief feels for this season. It’ll be caught up in this wonder and delight that I don’t get to share with my mom. It is that absence that I grieve every year. She’s not here to play on the floor with her granddaughter. She won’t be here when her second grandchild will be born. There will be a lot of love around these two little girls. They have three full sets of grandparents. They have a great grandmother and a military community that will always be there. There will be churches that will love them and watch them grow. There will be lots and lots of love, but it’ll be my job to tell both my girls about the grandmother they never met. It’ll be hard because I don’t remember her that well. It’s something I’m struggling with every afternoon as my daughter naps. 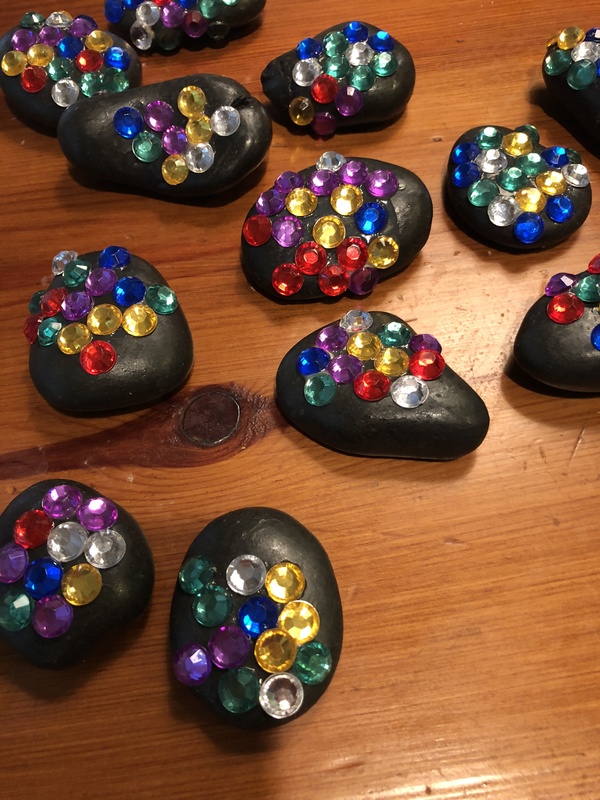 I sit down again and try to write about where my grief started. There are things I remember, snapshots mostly of doctor appointments and strange things that grownups said to me. There are a few memories where cancer didn’t overshadow, but I mostly remember her as being sick. I remember her dying. I don’t remember what she loved and what made her giggle. Those are the things I want to share with my girls, but what I do remember is what we did after she was gone. I remember what it felt like to do fun things after my mom died. I still have that guilt. It’s what hangs on tight thirty-two years later. It’s why I’d rather hide and quitely mourn by myself, but I can’t. This year, my sweet girl and I will be in my favorite city before my sister tries on wedding dresses for the first time. There will be a lot of joy surrounding us as I try to figure out how to grieve in the midst of it all. This brave woman is right to point out that the biases of a few are having a huge impact on an entire community, but I am not sure that it speaks volumes. I don’t want to that fear to trump everything, because I believe there is a voice we cannot quite hear yet. I believe that there is a louder voice in the next generation, those that are not yet old enough to serve as justices on the Supreme Court. Maybe they’re not that loud yet because they aren’t even old enough to vote, but I have faith that these children will lead us. These are the kids who grew up only knowing a black president. These are the kids that don’t remember anything before legal marriage for all people. Maybe they remember the Supreme Court decision. Maybe. Or maybe it has just been a fact of their lives. The Pew Research Center reported last week that these kids make up “the most racially and ethnically diverse generation” we have ever seen in this country. They haven’t had to learn gender-neutral pronouns. They haven’t stumbled over their words like I have because they’ve grown up with this vocabulary. It is said that this young generation, called Generation Z, is more liberal and more inclusive than their elders have ever been. My daughter is too young to be a part of this young generation. She is only 15 months old and so she fits with some evolving generation that doesn’t yet have a name. I don’t know what new things will be normal for her, but the statistics seem to hint that my little girl will only be more liberal. Generation Z is already 10% more confident with gender pronouns than Millennials. They are 3% more determined than Millennials in their certainty that our society is not accepting enough and their 6% more determined that the government needs to do more to solve problems for individuals and businesses. I don’t know who my little girl will grow up to be. I don’t know if her fascination with shoes and beaded necklaces is just a phase that will lead to something else, some new identity where gender is much more fluid. I know I will struggle because I am part of my generation, but I’m excited about what she will teach me. I’m eager to see how she challenges her old liberal mother. I hope she makes me squirm. I hope she pushes all my political buttons. I hope she teaches me more about love than I know now, not just because she’s my kid and my heart has grown in loving her. But, I hope that she thinks it’s silly that her Mommy ever had to fight for marriage equality. I wonder what she’ll think of the story I’ll one day tell her about officiating my first transgender wedding as much as I wonder if she’ll feel called to serve in the military like her Daddy. Watching her play on the floor yesterday with her wooden pots and pans, mixing up air with her play spatula, she’s already cooking up trouble. I couldn’t help but smile and think “it’s gonna be OK.” There is a temptation to despair. There’s a tendency among us old(er) liberals to think that the prejudices of a very small few will ruin everything, but I’m not going to fall into that fear. As it says in those words that we once carried through the streets in the name of marriage equality, “There is no fear in love, but perfect love casts out fear; for fear has to do with punishment, and whoever fears has not reached perfection in love” (1 John 4:.18, NRSV). I’m gonna strive for that perfection, that perfection that my daughter will one day teach me with a gigantic roll of her eyes. Fear doesn’t motivate or inspire, but love always does. I won’t be paralyzed by the feeling that there’s nothing I can do to reverse a Supreme Court decision. I’m not going to nervously analyze statistics across the generations, but I’m gonna figure out how I can raise my daughter and my family in the love that we believe should exist in our nation and especially in our military. I hope that that love is the loudest. It’s around this time of year that Christmas carols start playing in my house. It may be too early for some, but bah humbug to them. There is enough crap to bemoan in the world right now. There is more than enough that we can beat ourselves up over so let’s just not do that anymore. Not this year, especially not this year. There are too many ways in which I feel like I’ve failed: prayers left unsaid, expectations not met and so many ways that I’m fairly certain I’ve already failed at parenting. I don’t want anyone to tell me that it’s OK, nor am I interested in hearing about ways that I might improve. Or even that it will get better. This is the time of year where everyone seems to have this rosy idea about the way things should be. There’ll be no arguments about politics around the Thanksgiving table. No swell of sorrow for who is missing this year. No lamentation for the way things haven’t worked out this year in so many ways. It’s why I think Denial is My Spiritual Practice (And Other Failures of Faith) is exactly what we should be reading as Christmas comes. It makes me feel a little bit better that I procrastinated so dang long on writing this post to celebrate this wonderful book. 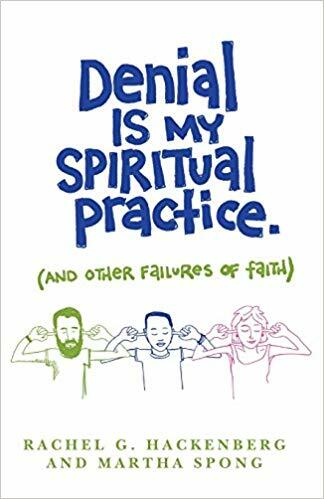 Aside from the silly cover that I can’t imagine was either of the authors’ first choice, Denial is My Spiritual Practice (And Other Failures of Faith) is the work of good preaching. It’s written by two wise women I’m glad to know. Both of whom are pastors and preachers and this fact flows through each and every essay. They are words of reflection and so very personal. I was awestruck by how intimately and honestly these two women shared in this small collection of essays. It is, in fact, something I remember asking Martha years ago when we were both pastoring in Maine. Martha has a talent for weaving the everyday ordinariness of her life into her preaching, but I was taught never to talk about myself. I was told to point to God. Martha laughed quietly, in her way, when I said that. She reminded me that every bit of that ordinary stuff points to God. I kept thinking about that conversation in her living room while the snow was falling outside all those years ago as I read these pages. Many of the essays speak of things that were happening then. I remember. I remember how it took trusted friends to hear these truths. These were not sermon topics, but the tender broken things you hold out to those that love you most to help you make sense of what does not make any sense at all. I admit that I cried reading more than half of this book because I remember how tender those days were. And yet, these were words that would not have been said then. No, the words in these pages are the work of grace. I wish there were more sermons preached with the grace of these two women. I wish faith was presented less as something complete and perfect and more like it is proclaimed in this small tome: confusing, challenging and sometimes just messy. It’s what we need to remember most at this time of year. Life is not perfect. We are not perfect. We fail but there is grace. Somehow, there is grace however much we might deny it. I’m grateful these two women got together and created this thing. It’s a gift and one that I think would be worth putting under the tree for your loved one who needs to remember that there is grace out there. I am honored to have been part of the Denial is My Spiritual Practice Launch Team where I got a free copy of this book from the publisher for my honest review.